Early Synagogues in the Galilee is part of the Tentative list of Israel in order to qualify for inclusion in the World Heritage List. Of the 7 synagogues mentioned in the UNESCO T List description (Meron, Gush Halav, Navorin, Bar Am, Bet Alfa, Korazim and Capernaum) we visited Bet Alfa and Capernaum. I will concentrate this review on the site at Beit Alfa. This isn’t so much about a “building” but consists primarily of a remarkably well preserved mosaic from around the early 6th C CE in “naïf” style. The mosaic was only discovered in 1928 when the local kibbutzniks were digging a water channel to drain thw swamps of the area. The site is situated around 15 minutes by road from Beit She’an and in my view is very well worth taking in. It is another Israeli National Park, so your entry pass will get you in – or else it will cost 22 NIS for a visit which will take around 30-45 minutes. The mosaic is completely covered by a climate-controlled structure and a visit consists of a periodically shown (“on demand” in our case as there were no other visitors when we arrived) AV presentation which is viewed/heard from a raised walkway which surrounds the mosaic plus a period of “personal” viewing whose length will depend on the queue of visitors for another “showing”. The mosaic fully covers what would have been the main hall of the synagogue and consists of several panels (28 x 14 mtr). We thought that the AV was well done – and well ahead of what one might have expected at what is, after all, a fairly small park even in Israeli national terms. It dramatized the decision of the local congregation to upgrade their mosaic floor, find the money, search for a mosaic artist and determine/agree the designs/scenes. In so doing it provided a “hook” on which to hang the introduction of a range of relevant aspects such as the social background of the villagers (this was no “grand” structure by the rich), and the beliefs about what should/should not be portrayed (somewhat surprisingly the Zodiac panel includes pagan symbols), as well describing each of the panels. Photography is allowed, but the light and relatively low viewing height above the mosaics make it difficult fully to capture the designs and colour (not helped by the very small display "area" Els allows us! 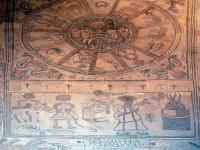 My photo shows the “Binding of Isaac” and, above it, the Zodiac. It is true the Galilee is crowded with early synagogues (Peki'in, Gush Halav, Meron, Amud, Baram, Navoria - just to name a few). The most impressive site I've been to is probably Capernaum near the Sea of Galilee also known for being the site of Petrus' house. The synagogue resembles a well preserved Roman temple and is also beautifully located near the shore. Another impressive building is the one in nearby Korazim. Synagogues with original mosaics are Beth Alpha, Hamat Tiberias, Maruth and Seppharis. These show the strong Roman influence on the Jewish culture of the time by combining Roman gods in the depiction of Biblical scenes. I haven't been to Maruth but the other three are impressive and probably unique. I think this nomination could fill a gap and be justified.